The four human functions - intuition, thinking, feeling and sensing - can be found at the heart of several schools of thought including Numerology, Tarot, Kabbalah and Myers Briggs Personality Types. In Numerology the ten digits - 0, 1, 2, 3, 4, 5, 6, 7, 8, 9 - are analysed by distribution upon a 3x3 grid pattern (see the Gifts & Talents page) that is derived from the structure of the Tree of Life of the Kabbalah. Above the grid sits the spiritual quality of 0 which represents an unknown quality of spirituality and undeveloped potential. The 0 sits above the grid in the same way that the Ain Soph Aur (the Absolute Limitless Light) sits above the Tree of Life. The rows of the grid represent the Planes of Activity - Spiritual, Universal, Social and Individual and are aligned with the four Worlds of the Kabbalah - Emanation, Creation, Formation and Manifestation. The columns of the grid are derived from the pillars of the Tree of Life - Mercy, Mildness and Severity. In Numerology they are referred to as the Modes of Expression - Feeling, Doing and Thinking. The fourth Mode of Expression - Intuition - sits to the side of the grid (similar to spirituality above) and provides a dimension of depth. Intuition, like spirituality, is a quality of intensity and brings depth to the human presence. The digits are used to measure things in the real world and as such it is appropriate that there is no direct alignment between the quality of Intuition and any specific digits, as it comes from somewhere else outside of yourself. Intuition is measured by consideration of the intensified numbers when a birth date or name is applied to the grid. Intuition is aligned with the quality on the Kabbalah’s Tree of Life known as Daath, which represents hidden and unknown knowledge. This is an instinctive quality of intuition which gives depth to the human existence and the grid. Each cell of the grid is the specific home of one of the digits and two of the letters of the alphabet. 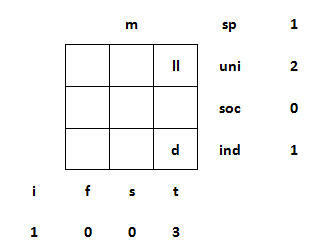 The digits of a birth date and the letters of a name are distributed on the grid into their specific cells. 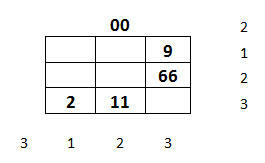 Then the number of digits or letters in each row and column is counted to provide scores. The number of 0’s are counted to give a score for the Spiritual Plane. The score for Intuition is the count of the excess digits. These scores are then used in calculations to provide a Personality Type. This can done for either birth dates or names. This provides an objective method of comparison of the influence of a date and a name. Note that I said the “Personality Type for the Birth Date and the Name” and not the “Personality Type of the person”. In the optimum situation where a person is in harmony with the Universe then the harmony of the Personality Type for the Birth Date and/or the Name would be more likely to be in harmony with the Personality Type of the person. The Birth Date Personality Type is the perfect match with your Soul Purpose and your Birth Name Personality Type is the perfect match for your Ego Purpose, but you have not grown and developed in a perfect world and you may just be learning about getting into sync with your Life Path. People are not always true to their calling and their choices in life may have them on a different path and away from their true intended life path. There are always dualities that provide tension and harmony. The Birth Date and the Birth Name are one of these dualities. The tension between the two - like the strings of a musical instrument - provides the dance of life. 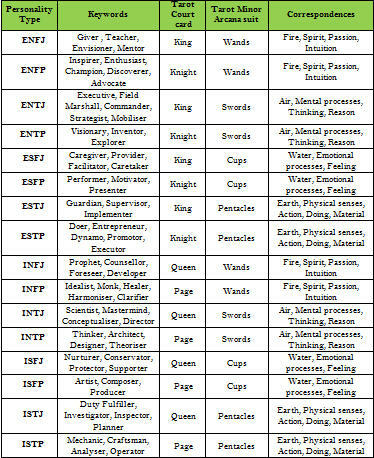 The structure of the Numerology Personality Profile is based upon one of the best known and widely used methods of personality testing - the Myers Briggs Personality Type Indicator. This test was created by Isabel Briggs Myers and her mother, Katharine Cook Briggs who were students of the ideas of psychologist Carl Jung. Jung developed the four human functions of Sensing, Intuiting, Thinking and Feeling. Jung also developed three original pairs of preferences - Extroversion and Introversion, Sensing and Intuition, and Thinking and Feeling. Myers & Briggs added a fourth pair - Judging and Perceiving. The test identifies your dominant behaviours - the ones you are inclined to use more often. Many people show various qualities in their behaviour and no one is necessarily one way or the other. Why you use one more than the other could be due to many varied influences. They could be instinctive or learned behaviours. The paired preferences form what is defined as a dichotomy - a splitting of a whole into exactly two non-overlapping parts. It is a procedure in which a whole is divided into two parts that are mutually exclusive. Plotting the pairs along a straight line that is called a continuum, the opposing qualities sit at either end of the continuum. Our scores will generally place an indicator somewhere between the two opposing poles of the continuum, suggesting that we tend to be more like one or the other in our dominant behaviour. Most personalities do not behave in one way all the time. They will be dominant in one but will often behave in the other way as well. Extroversion suggests that energy is derived from exposure to the outer world as opposed to Introversion that is energised by quiet times in the inner world. An extroverted person will be drained of energy if forced to spend too much time in an introverted setting and likewise an introverted person will quickly drain if exposed too long to an extroverted setting. Some people will require a balanced mix of both. Sensing and Intuition both relate to external sources of information and data gathering. Sensing refers to the use of the five senses and our interaction with the manifest, material world - this is physical. Intuition is influenced by patterns and subtle flows of information that may be termed “inspiration”. We tend to display dominant behaviour either one way or the other. If our scores are equal then we are seen to be reasonably balanced. Again no one uses one way all the time - it is more about using both at different times but we will tend to be dominant in one way. It is important to repeat here that both qualities are deriving information from an external source. One is in the physical world and the other is in the non-physical world. Thinking and Feeling both relate to energy that is deployed internally within ourselves. Thinking may be seen as more objective than Feeling whereas Feeling is more subjective. We tend to be dominant in one way or the other but we all feel and we all think. Some of us will have scores that suggest we are balanced. It is important to repeat here that both qualities are using internal energies. One is objective and the other is subjective. Judging and Perceiving relate to what we do with the data that we have gathered from our external and internal sources. Other words for this opposing pair are Structured or Flexible. Those who lean more dominantly towards Judging are more likely to be decisive and structured. Perceiving people are more accepting of difference and flexible. Again we use both forms but tend to be more like one than the other. Another set of terms for this pair is divergent and convergent. Our schooling system tends to train us in convergent thinking. For instance, we are taught to do sums where there is a single correct answer? Divergent thinking teaches us to consider a single issue and come up with a dozen different possible outcomes. A Judging personality will tend to be dominantly convergent in their thinking and will like to narrow it down to one answer. A Perceiving personality will tend to be more divergent in their thinking and will like to consider all of the possibilities. The four human functions - Intuition, Thinking, Feeling and Sensing - as defined by Jung, are the key to determining preferences. 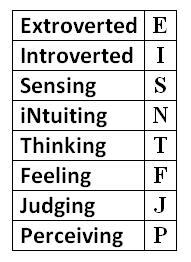 Two of the paired sets - Thinking vs Feeling - Intuition vs Sensing - are directly derived from the scores on the grid for the four human functions. The other two paired sets - Extroversion vs Introversion - Judging vs Perceiving - are derived from calculations that operate upon the scores on the grid. Judging combines the functions of thinking and feeling. Perceiving combines the functions of sensing and intuition. Extroversion and Introversion bring into the calculation not only the preferred Modes of Expression but also the preferred worlds or Planes of Activity. For this exercise, I am using the grid for the Birth Date of Marilyn Monroe, that we developed in the Gifts& Talents section . Scoring Extroversion and Introversion combines the scores of the four Modes of Expression with the scores of the four Planes of Activity. An Extroverted personality will be more inclined to operate outside of their self on the Social and Universal planes. The functions of sensing and intuition both derive information from external sources. To calculate the score for Extroversion, add together the scores for the Social Plane (2), the Universal Plane (1), the score for Sensing (central, physical column - 2), and the score for Intuition (3). This gives a total score of 8 for Extroversion. The Introverted personality will prefer the solitude of the Individual and Spiritual planes. The functions of thinking and feeling both operate internally. To calculate the score for Introversion, add together the scores for the Individual Plane (3), the Spiritual Plane (2), the score for Thinking (3), and the score for Feeling (1). This gives a total score of 9 for Introversion. Comparing the scores for Extroversion (8) and Introversion (9), the behaviour with the highest score, and therefore the dominant, behaviour is Introversion. Compare the score for the central, physical column (2) and the score for Intuition (3). Whichever score is the greatest is the dominant function. In this instance Intuition has the highest score. 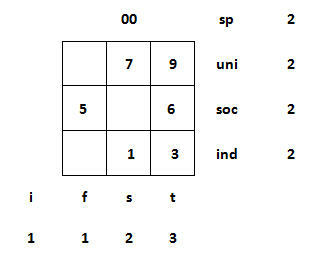 In the event that the scores are equal, then the person is considered to balance with respect to these two functions. They can operate comfortably in either scenario. As you progress through the full analysis you may find other factors that suggest a dominant function. This personality is a dominant Intuitive and more open to information derived intuitively. Compare the score for the right hand, thinking column (3) and the score for the left hand, feeling column (1). In this instance Thinking has the highest score. This personality has a dominant Thinking function and is more inclined to be influenced by their thoughts and mental processes before their feelings and emotional processes. Judging and Perceiving involve a comparison of the quality of making decisions versus gathering the information to make the decisions about. To calculate the score for Judging, add together the scores for feeling (1) & thinking (3). This gives a total score for Judging of 4. These two functions are about making decisions from our inner being - Judgments about how we think and feel. Feeling is warm & fuzzy. Thinking is about getting to the point. Together they represent the complete process of Judging. 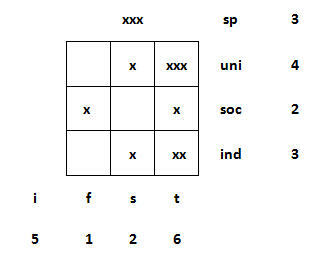 To calculate the score for Perceiving, add together the scores for Intuition (3) & Sensing (2). This gives a total score for Perceiving of 5. These two functions are about gathering information from totally different sources - one is airy and the other is material facts. Together they represent all of the possibilities. Comparing the two totals - Judging (4) and Perceiving (5) - gives us an indication of the dominant behaviour. In this instance the dominant behaviour is Perceiving. The personality type for Marilyn Monroe's birth date is derived from the letters of their dominant behaviours - Introvert, iNtuitive, Thinking & Perceiving - INTP. 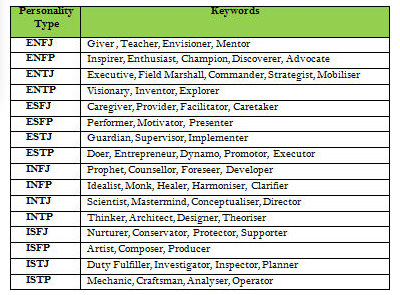 The table below shows the 16 Myers Briggs personality types related to the descriptive keywords and the Court cards of the Tarot Minor Arcana. The personality type INTP is described as the Thinker, Architect, Designer and Theoriser. Myers Briggs and the Tarot both have 16 personality types. Each of the four suits of the Tarot Minor Arcana - Wands, Swords, Pentacles and Cups - have four Court cards that are given the designation of Page, Knight, Queen and King. These cards are easily aligned with the Myers Briggs personality types and can be used as labels along with the Myers Briggs coding of ESTJ or INFP etc. The INTP type is aligned with the Page of Swords. 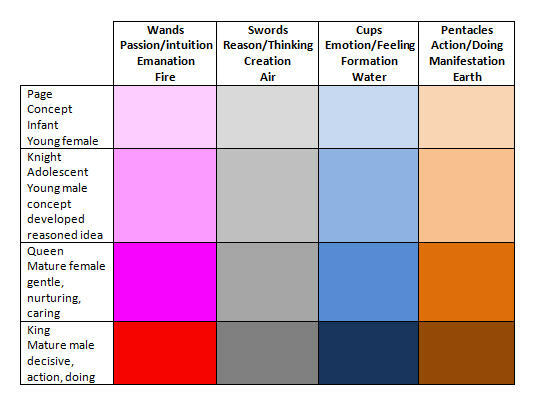 Swords is the suit of the air element and the thinking, mental processes. Pages are very young people and also represent concepts. Norma Jeane had a Soul Purpose Personality Profile that describes her as an original thinker. Considering the difficulty of her early life and the challenges she faced, it is quite remarkable that she had the mind to conceive the character and personality of Marilyn Monroe. This analysis provides a side of Marilyn that is quite surprising but fits very easily with what was necessary in her life to survive and achieve the fame of her designed personality. The chart below identifies the qualities of each of the Court card personalities. Here is another example - the Dalai Lama. The birth date for the Dalai Lama shows an Introverted preference. The dominant preference is Sensing. The dominant preference is Thinking. The dominant preference is Judging. Summary for the Dalai Lama. The Birth Date of the Dalai Lama has a personality type of ISTJ - the Duty Fulfiller, Investigator, Inspector and Planner - Tarot Court card Queen of Pentacles. Pentacles are symbolic of earth, action, and making things happen - Queens are gentle, nurturing and caring. Considering that the name “Dalai lama” is really a title then the keyword phrase “Duty Fulfiller” is an exceptional match. The name “Dalai Lama” transcribes to the grid as shown below. Only the consonants are used. The name of the Dalai Lama shows an Introverted preference. The dominant preference is iNtuiting. The name “Dalai Lama” has a personality type of INTJ - the Scientist, Mastermind, Conceptualiser and Director- Tarot Court card Queen of Swords. Swords are symbolic of air, reason, thinking, mental processes, and creation - again, Queens are gentle, nurturing and caring. The combined forces of the birth date and name of the Dalai Lama generate an Extroverted preference. The preferences of Judging and Perceiving are Balanced. The combined Soul Purpose and Ego Purpose of the Dalai Lama has a personality type of ENTB. This means that the Dalai Lama comfortably operates as either an ENTJ or an ENTP and may swing between both extremes. ENTJ - the Field Marshall, Executive, Commander, Strategist, Mobiliser - Tarot Court card King of Swords. Swords are symbolic of air, reason, thinking, mental processes, and creation - Kings are decisive and action oriented. ENTP - Visonary, Inventor, Explorer - Tarot card Knight of Swords. Swords are symbolic of air, reason, thinking, mental processes, and creation - Knights put concepts into action they are active and impulsive.